It may be a bit confusing if you never loaded in new sounds into your synthesizer via the midi port – so we have put a tutorial together on exactly how it’s done. When you purchase any of our sounds in PC format we usually provide the files in both system exclusive (.syx) and standard midi files (.mid) formats . This gives you a wider option as to what programs you can use to load the sounds. There are many programs that you can use to load the standard midi files including DAW programs such as Logic, Cubase or Digital Performer. 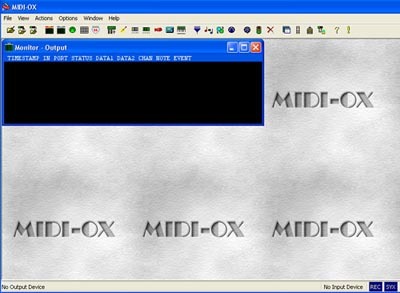 We also provide a easy to use program called MIDIOX (http://www.midiox.com) that you can use to load our SYSEX files. 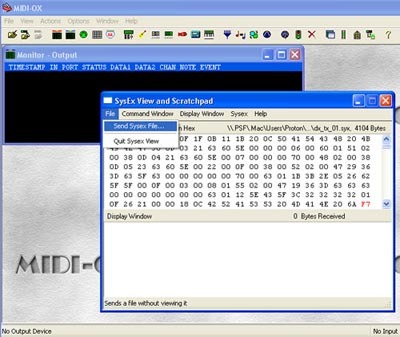 This tutorial will show you how to load in SYSEX (.syx) files using MidiOX. 1- Make sure you “Save” your internal sounds before loading in our sounds. Our sounds will replace your internal presets, so it’s best to save them to disk so you can reload them in later if you wish. Many synths have a “re-initilize memory” setting which you can use to restore the original factory settings. Each synthesizer is set up differently – so refer to your owners manuel on how to transmit a “Bulk Dump” or “Sysex Dump” from your synth to your computer. Be sure you have installed the latest drivers for your MIDI interface (these are available from the maker of the midi interface). 2- First you need to set up your synthesizer to receive the file. The owners manuel will also inform you on how to set up your synth to receive a “System Exclusive” or SYSEX Dump. Some synths require you to turn off the memory protect. Others require you to “Enable” or “Turn on” the System Exclusive. It varies from synth to synth. We recommend that you set your synthesizer to Midi Channel #1. This is the default channel when “Midiox” loads. 4- Open Midiox and click on “Help/Contents/Getting Started” and read that. Also click on “Making Connections”. That tells you how to connect Midiox to your synthesizer. You set this up by going to “Options/Mididevices”. While your in the contents menu also click on “System Exclusive/Sending A File”. Under the “Options” menu, select “MIDI Devices”. 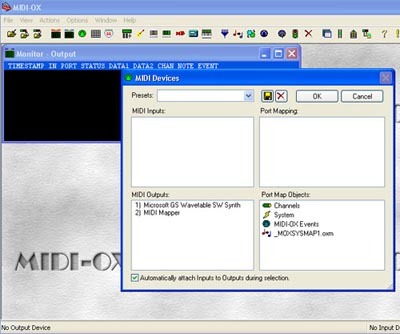 Look in the “MIDI Outputs:” box and select the appropriate MIDI OUT device (this tells MidiOx where to direct the MIDI data). If you do not see an entry for your MIDI interface, then you probably need to reinstall or update the appropriate drivers for your MIDI interface. 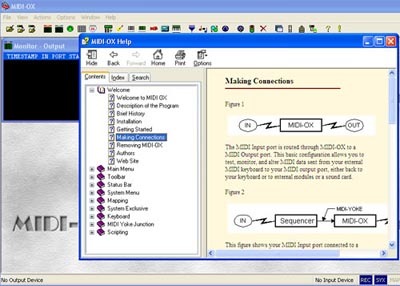 5- Then take any one of our sysex files and drag them from your desktop into the “Monitor – Output” box. The Sysex View and Scratchpad window should pop up and you should see the data in the window. Then go to the File Menu and click on “Send Sysex File. The data will automatically begin sending to the synth. Wait for the progress bar to complete. If you have everything set correctly the file should now be loaded into your synthesizers internal memory. Complete info on all our sounds can be found at: www.kidnepro.com. If you have any questions please contact us via phone or e-mail. Do you have the above instructions to transfer Sysex files from DX7 to Computer and vice versa? Hello you guys, can someone tell me if it’s possible to add korg M1 sounds to a korg 01w FD via midi adapter ?